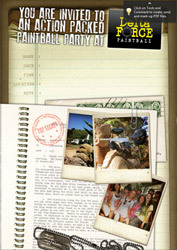 Over the last 20 years, Delta Force has organised thousands of unforgettable birthday parties. With unique Delta Force party invitations available for download and a plethora of distinct games to single out the lucky birthday person, it’ll be the most fun and talked about birthday party of the year. For those taking part in the action, our M*A*S*H themed base camp will be your headquarters for the day where you can rest in between games and talk tactics for the upcoming missions. If you’d prefer to wait for the troops until they return from battle, feel free to wait in the base camp and possibly even welcome them back with a cake to celebrate the occasion. With covered seating and picnic tables, it will be a fun and enjoyable day out for everyone. If safety is your concern then you can rest assured that all players will return safely, if not a little bit muddy. 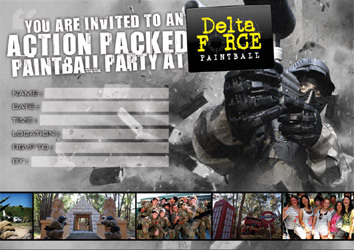 Delta Force is the industry leader in Australian paintball, and our safety practices, procedures and equipment are correspondingly high. If the birthday person wants some ‘special’ treatment on the day then just let our staff know and they’ll do the rest. Special games can be arranged and they might even be the lucky recipient of the President’s fluorescent jacket to ensure they stand out from the pack. Will you protect the President as he/she storms the pyramid, or will you light them up like a Christmas tree? Whatever you decide, you are guaranteed to have a day full of fun and laughter with the best paintball centre in Melbourne! 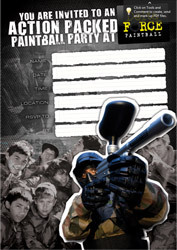 So what are you waiting for, gather the troops and get them ready for an action-packed Delta Force birthday party!